From left: Tan, IGB Corp chairman Tan Sri Abu Talib Othman, Selia Pantai MD Datuk Mohamed Zaini Amran, Ghani and Kumpulan Prasarana Rakyat Johor Sdn Bhd chief Executive officer Johar Salim Yahaya looking at a model of the proposed Southkey Megamall in Johor Baru. KUALA LUMPUR: The proposed Mid Valley City-type mixed development in Johor Baru, via a joint venture between IGB Corp Bhd and Selia Pantai Sdn Bhd, is expected to take four to five years, and has a tentative gross development value of RM6bil. “Tentatively, the project will have a gross development cost of RM2bil to RM3bil. It took us 15 years to get Mid Valley City to what it is today. Hopefully, it will take us only half that time with the Johor project,” said IGB Corp group managing director Robert Tan. IGB Corp, the developer of Mid Valley City in Kuala Lumpur, has entered into a conditional memorandum of understanding (MoU) with Selia Pantai for the joint venture. Johor Menteri Besar Datuk Abdul Ghani Othman, who witnessed the MoU signing, said the project would complement other developemnts in the Iskandar Malaysia economic growth corridor. A joint-venture company called Southkey Megamall Sdn Bhd will be set up to acquire three parcels of leasehold land measuring 36 acres for the project within the 300-acre Southkey development in Johor Baru. Selia Pantai is the Southkey developer and is a public-private partnership between the Selia Group and the Johor government via Kumpulan Prasarana Rakyat Johor Sdn Bhd (KPRJ). 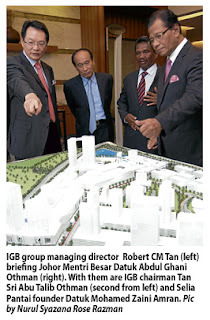 IGB Corp will have a 70% stake in Southkey Megamall, with the balance owned by Selia Pantai. Southkey is located within the Johor Baru city flagship zone A of Iskandar Malaysia and is accessible via five-minute drive from the Sultan Iskandar Customs, Immigration and Quarantine (CIQ) complex as well as via Jalan Tebrau, Jalan Bakar Batu and the Eastern Dispersal Link. Tan said it was a great location for the proposed Southkey Megamall. “It is not easy to find a location like this. We are bullish on the Johor market. There are many things happening in Iskandar Malaysia,” he said. He said Selia Pantai had approached IGB Corp about six months ago with the proposal for the project, which is planned to have a retail mall as well as hotels, serviced apartments and offices. The proposed Southkey Megamall will have six million sq ft of space, and will include a net lettable area of 1.5 million sq ft, with about 7,000 carparks and can accomodate two major anchor tenants as well as 400 to 500 retail outlets. IGB Corp will fund its portion of the project via internal funds and bank borrowings. According to Tan, another six to nine months will be needed to do studies as well as resolve planning approvals and other issues pertaining to the project. “We hope to start construction in 2013. This is our first project in Johor. we are always on the lookout for opportunities. We want to look in the north also. Ideally, we want to have Mid Valley City-type developments in the south, central and north (Penang),” he said. LANGKAWI: Tradewinds Corporation Bhd's subsidiary, Benua Mahsuri Sdn Bhd, will build an international-standard resort hotel on this duty-free island. Langkawi Development Authority (LADA) chief executive officer Tan Sri Khalid Ramli said this would draw more affluent tourists to Langkawi, hence increase the island's tourism receipts per capita in the future. He was speaking to reporters after signing the land lease agreement with Tradewinds Corporation chief executive officer Shaharul Farez Hassan here today. The hotel will be built on LADA's 36.7-acre land in Teluk Burau. Khalid said the project would create over 400 new jobs. PETALING JAYA: Syarikat Prasarana Negara Bhd will work with a local property developer to build a RM200mil high-rise mixed development project over its underground Dang Wangi light rapid transit (LRT) station. Managing director Datuk Shahril Mokhtar said they had made the decision last week in selecting the best developer to work with Prasarana and due announcement would be made soon. “The bidders submit their proposals via an open tender process and presented their creative ways to develop the piece of land there. “It’s going to be a mixed development of offices and residential units,” he told reporters after the memorandum of understanding signing yesterday between Prasarana and the Malaysian Anti-Corruption Commission yesterday. This property venture will be the first for Prasarana that is expected to enhance its revenue stream. It was previously reported that UDA Holdings Bhd was one of the developers that had sent a proposal to Prasarana to jointly develop the 11,008 sq m.
Previous reports also described that the Dang Wangi development might be emulating the Kuala Lumpur City Centre with underground LRT. Going forward in this new venture, Prasarana would also be looking at other locations with potential to have property developments especially in high traffic areas such as Ara Damansara, Subang Jaya KTM station and Awan Besar along the Kesas Highway. KUALA LUMPUR: Nakamichi Malaysia Sdn Bhd has signed a sale and purchase agreement with Century Advance Technology Sdn Bhd for the proposed disposal of a piece of industrial land and building for RM19mil. Nakamichi Malaysia is a wholly-owned unit of Nakamichi Corp Bhd. Nakamichi Corp, in a filing to Bursa Malaysia yesterday, said the proposed disposal was expected to be completed in the fourth quarter of 2012. PETALING JAYA: Bandar Raya Development Bhd (BRDB) is one step closer to selling off its four prime assets via an open tender, after the company announced the appointment of its legal and financial advisers to assist in the deal. In a filing with Bursa Malaysia, the company said it was working with Lee Hishammuddin Allen & Gledhill and CIMB Investment Bank Bhd to assist in the proposed disposal. It said the board had decided to proceed with the proposed disposal, while noting that Ambang Sehati Sdn Bhd had to-date been unable to confirm its plans to increase its stake in BRDB. In September 2011, Ambang Sehati proposed to buy BRDB's properties, namely Bangsar Shopping Centre, Menara BRDB, CapSquare Retail Centre and Permas Jusco Mall for RM914mil. The proposal drew criticism from various parties, who expressed concern over the lack of transparency in the deal and the fairness of the offer price, coupled with the fact that it was a related-party transaction. Subsequently, the company called off the sale and decided to call for an open tender to take into consideration the interest from credible parties to acquire its assets, and also Ambang Sehati's intention to increase its stake in the company. Ambang Sehati is the private investment vehicle of Datuk Mohamed Moiz Jabir Mohamed Ali Moiz, BRDB's chairman, who owns 18.88% of BRDB. “The company had decided to proceed with the disposal exercise. Last year, when the news broke (about the four properties), Ambang Sejati wanted to buy (them). At that point in time, Ambang Sejati was thinking of increasing its stake in the company, that is why the board decided to defer the exercise. “That was 2011, and now Ambang Sejati is still evaluating its options, but the board can no longer wait for them and this (announcement) is a go-ahead with the tender,” said a source familiar to the matter. He said the company had not appointed a property consultant yet but the legal adviser appointed was in the midst of finalising the proposal on how to go ahead with the tender. OSK Research said it was acceptable for BRDB to monetise its assets as long as the company disposed of them at a fair and attractive pricing. “As we think Ambang Sehati's offer price is unattractive, we see the open tender route as positive as this would enable the group to garner better pricing for its assets via competitive bids from other interested parties,” it said. It said it was very likely that the company would distribute some of the disposal proceeds as special dividend to its shareholders.